I will keep this part super-short and take you directly to the land of some amazingly clever copywriting used in modal boxes, CTAs, among other elements on websites. Some of them are straightforward, some unconventional, some unapologetically honest and most of them witty. However, what bind them together is that they are all very hard to resist. 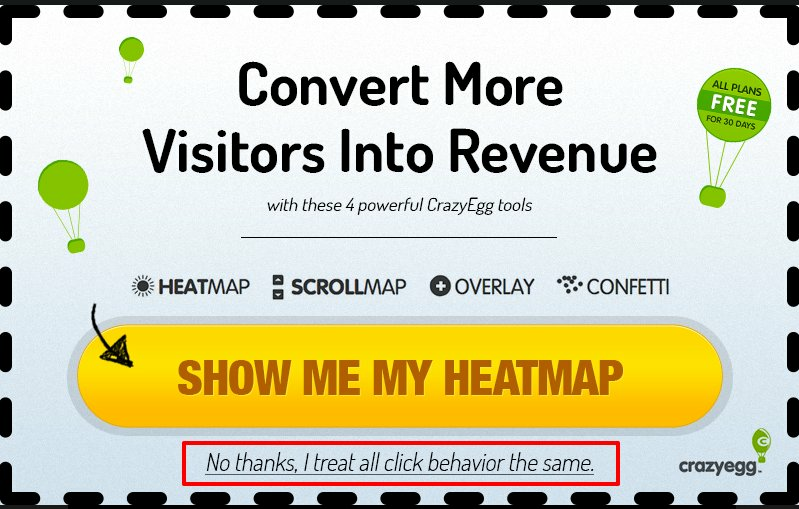 Would you click on “No thanks, I treat all click behavior the same?” Well, you would certainly if you were busy or simply not interested in heatmaps. But not before experiencing that feeling of missing out on something important. 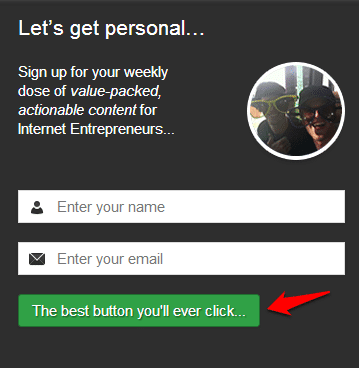 Most modal boxes have a cross button on the right which you can click to close the box. But by removing that functionality and instead providing this link to close the box, the visitors are forced to read what’s written there. And once they do read that, those who had no intention of wanting to know about heatmaps will probably also go through the whole copy to at least find out what is being talked about. If you want a lesson in how to speak the language of your customers (read: readers), take a cue out of Cracked’s message in the above screenshot. Most websites will either ask you to ‘Like’ their website or ‘Share’ the product you have just bought in as many words. Most of the times, people don’t even pay attention to the social sharing widget unless and until they have the motivation to share it on the social media. Cracked pushes the envelope by asking you to ‘Like’ their page in a manner that sounds like an extension of its content — cool, brazen and fun. Hence, they strike an immediate connect with the readers. FYI: The number of Likes have crossed the 3m-mark. Gone are the days when websites could get away by just flashing massive blocks of fonts saying ‘404-Page Not Found’ when a wrong URL query reached their servers. 404s have become cooler and more optimized than ever. Skype’s 404 page particularly stands out for its awesome copywriting. Apart from efficiently optimizing the page by leaving the navigation menu open for visitors to redirect to other pages, the fine folks at Skype have done a really cool copy that will leave the visitors chuckling. They have also smartly provided the most important links — Download page, Feature page, Support and Homepage — that a lost visitor might be in need of. Move over Download, Sign-up, Enter or Click Here, this call to action (CTA) by the bros of StartupBros will surely take you by surprise. While many could think of the CTA text — The best button you’ll ever click — as unabashedly confident or may be even slightly arrogant, the text goes well with the brand image of StartupBros. The voice in which Will Mitchell, the founder, communicates with the readers in the blogs is extremely cool and casual — something that the CTA also echoes. Do you have enough traffic? That’s a hard question. How much traffic is enough anyways? Who doesn’t want to increase their website traffic? 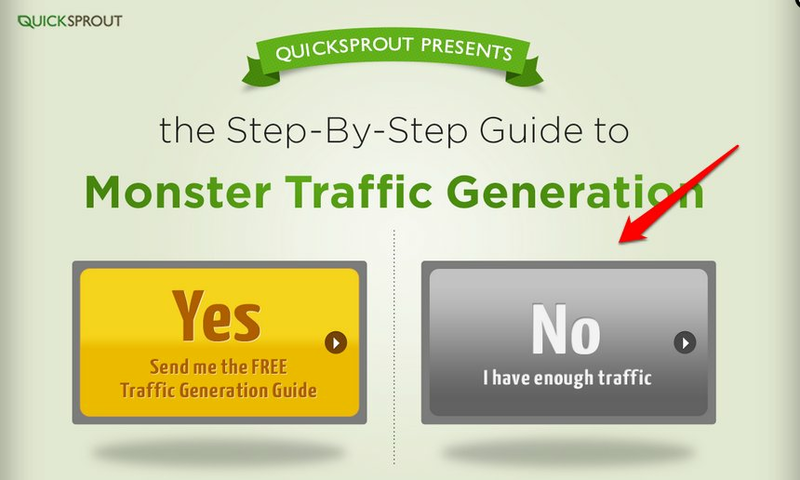 Yet again, by giving the visitors just this one way to close the box — by clicking on No, I have enough traffic — QuickSprout hits the nail on the head. Low website traffic is a common pain point for most online businesses. The visitors will be lying to their souls if they click on that button. Thumbs up for this one. So Google has stopped telling you what keywords people use to come to your website. End of the world? Not at all! WebEngage uses an extremely useful pop-up on its homepage that asks visitors what they typed in the world’s favorite search box to land on their site. That’s a smart way to get some extremely insightful information from the visitors. What works for me personally in the copy is that it doesn’t beat around the bush. The guys at WebEngage are pretty straightforward and honest about what they want to know and are not trying to conceal the message through sweet deceit. If there was ever an award for best product descriptions in the eCommerce industry, Woot would probably be among the top contenders for the honor. Their product copies are funny, clever and rich in details, breaking away from the standard bland descriptions. And when it comes to CTAs, they do away with the conventional ‘Buy Now’ and ‘Add to Carts’ and instead make the visitors say I want one. And if you are just about looking at the screenshot above, you might also want to read the write-up of the day as well (towards the right). Want to get someone to subscribe to your newsletter or blog? Conveying the main benefit or value proposition right in the headline is cool. That’s what everyone is doing. But WiderFunnel goes a step further and intelligently binds the value proposition with a little ego-booster for the visitor. 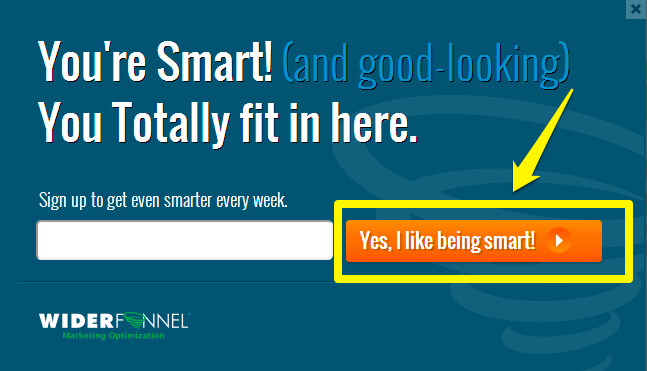 Note how the word ‘Smart’ appears at all the three places — the headline, the sub-head and the CTA. And by saying You Totally Fit in Here, they are setting rather high mutual standards of smartness. A little compliment, after all, never hurt anybody. This BounceExchange modal box again plays on the fact that people will be reluctant to click on something they know is not true for their business. Rather than just giving an option to close the box, this message cites a reason that most people will be uncomfortable agreeing with. These were some examples of intelligent copywriting but you need to figure out what is intelligent for your audience/readers and business. What works for a company or even for that matter many companies, won’t necessarily work for you. Try A/B testing different CTA text or headlines to see how it impacts your conversions. If you feel inspired, you might as well sign-up for a free trial of Visual Website Optimizer and start testing right away. I love the 404 page for Hasbro. It’s pretty funny. Hey guys, just wanted to chime in on the “hard to say no” CTA’s and say those are super annoying. I should add they might not be annoying if intelligence is built in to remove them after rejecting the offer or subscribing. Not being afraid to step outside the norm can yield better results. Most of the examples you have pointed out immediately establishes a connection with the user by making it fun or pointing out a problem. I may just try some of these on my website. Is there any alternative to bounce exchange that’ll allow us to make the modal as customizable as above? Because bounce start at $2999, something more than most people’s monthly income!! WOW that is nuts Amod! There are definitely some nice pop-up alternatives out there that won’t bankrupt you! Just Google around for WP Popup Plugins, preferably premium ones. Off the top of my head, Popup Ninja, Pippity, or OptinSkin would all be able to do it. There are some that are even intelligent as Chris referred to above. The Crazyegg modal box actually made me angry. After banner blindness I now get modal box blindness. I automatically search for the close button. After I didn’t find it clicked on the “no thanks” link rather hard. I want to read the webpage first and then I decide what to do. And not vice versa. 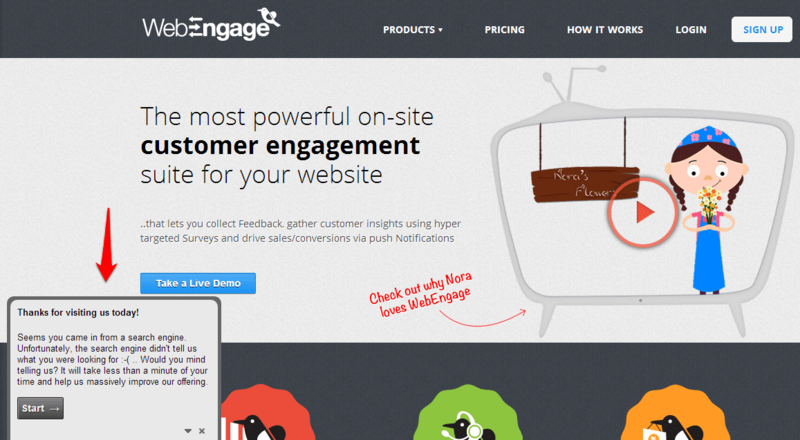 The popups like Webengage (will check them out) are so much better IMO. Here *is* a few ideas? 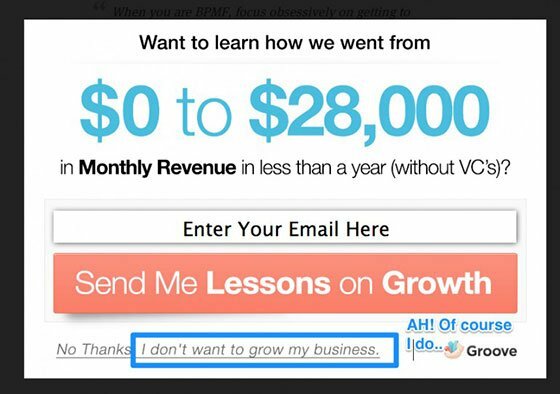 Hmmm… Guilt is never a great motivator to win a conversion. All though, stellar, creative copywriting is! Cool stuff and thank you for the tips. Professional content writing services are of a great essence and most of the marketing agencies have been understanding this. Great post, though! Please provide about how to overlap the copy writing skills as i shall be waitjng for your next post.